Hampton@: More Secrets from the White House, Road Trip, Train Like an Olympian and Honoring Our Veterans! More Secrets from the White House, Road Trip, Train Like an Olympian and Honoring Our Veterans! We’re running #50DaysOfSouthCarolina on my Twitter and Instagram right now  please join me and share your interesting facts and amazing pictures of our great state! Last week, we learned yet again that the Obama Administration’s claims of transparency are a charade. The Administration secretly delivered 400 million dollars in cash to Iran, a country that is known to sponsor terrorism. By negotiating with terrorists, President Obama continues to put all Americans, especially those who are abroad, at risk of being captured or attacked. To read my full statement, please click here. Each year, I visit all 46 counties in South Carolina in order to meet constituents from across the state and hear their concerns. This is by far the most important and best part of my job. 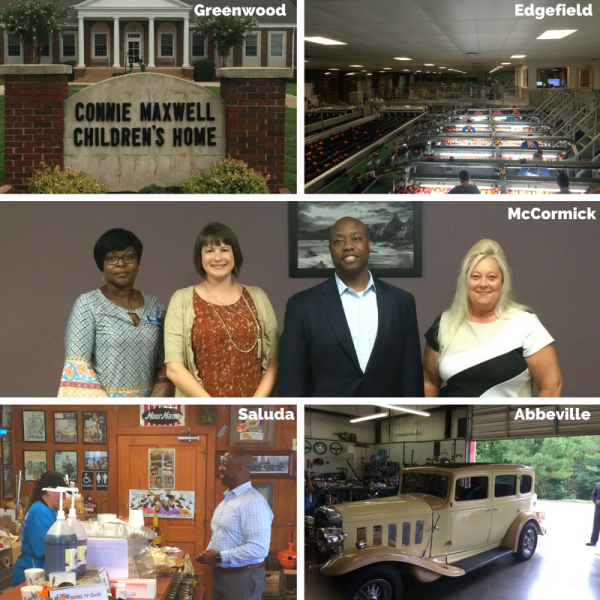 I had a great time visiting Greenwood, Edgefield, McCormick, Saluda, Abbeville, Aiken, Bamberg, Barnwell, Allendale, Hampton and Colleton counties last week. So Team Scott might not be ready for Rio, but we know Team USA is! Check out Team Scott training for the Olympics here. The men and women who have served in our armed forces deserve to be recognized for their willingness to defend our country against those who would harm us. On August 27th, I will host Desert Shield and Desert Storm Honor Ceremonies in Greenville and Charleston. Since being elected to federal office, I have hosted several honor ceremonies for South Carolina’s veterans in an effort to show appreciation for all that they and their families have sacrificed. In 2012, World War Two veterans were honored, in 2013 I held two ceremonies celebrating our Korean War era veterans, and in 2014 our Vietnam War era veterans were honored. Each veteran will receive a special Senatorial Certificate of Appreciation, as well as a pin representing the campaigns they served in. All interested veterans should register with my office by visiting scott.senate.gov/veterans or calling 844-872-7626. It is an honor to host veterans and their families in celebration of their service to our country. I look forward to seeing everyone there!